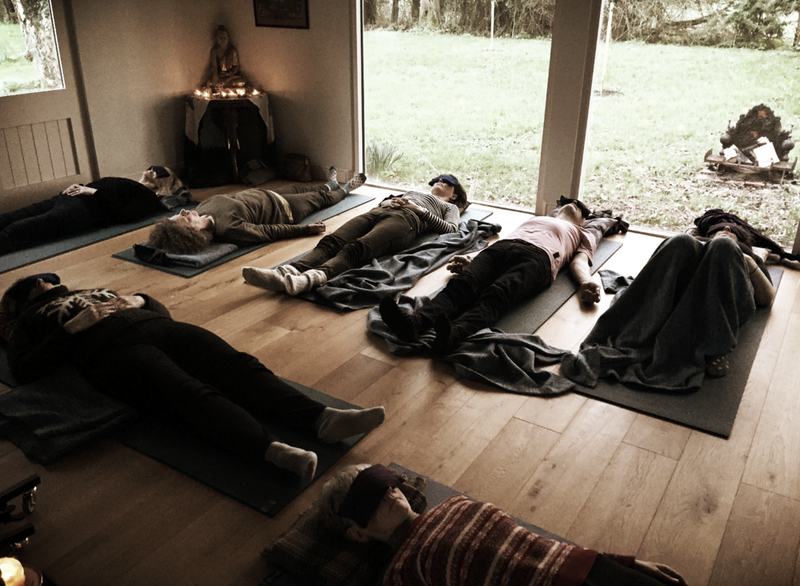 An opportunity to unwind, the Yin yoga postures are practiced on the floor and held passively for several minutes in order to reach a safe and positive ‘stress’ on the deep layers of connective tissue in the body. Physically, Yin Yoga restores and maintains the natural mobility of the joints and energetically, it opens the body’s meridian system, which enhances the body’s energetic flow and supports emotional equilibrium. Practicing before a gong bath enhances and deepens the vibrational experience of the gong bath. Gong baths are now fortnightly and the new schedule began on 6th January They will run at 5pm and 7pm as usual. This is the last gong bath of 2018 and follows the extended gong bath earlier in the day. It will be a time to seal any intentions that you may have been pondering upon and it’s an opportunity to check in with you body and listen to how it is relaxing over this holiday period. We can get very caught up in a period of time and forget for a short time what is really important in this life and having an hour to yourself may reset your inner dial and help you rebalance mind, body and spirit. There will be refreshments afterwards including a glass of mulled wine. From 2019, starting Sunday 6th January, the gong baths will be fortnightly. They will still run at 5pm and 7pm. They will resume back to weekly sessions in April. THERE will be no 5pm GONG BATH as the extended gong bath will go straight through to this. Those wishing to come to 5pm gong bath please consider booking 7pm bath. Because the last extended gong bath was too full, this will now be limited to 15 places. These are only available on booking. This is quite a stressful time of year. We have family, lots of cooking and eating, lots of laughter and lack of sleep. This extended gong bath is time to recalibrate and just have time out without anything to do and without having to juggle things, make conversations, run about, keep the peace etc. This is a time for you and you alone and so starting with a gentle restorative yoga session provides time to wind down. This deeply relaxing and beneficial session begins to slow breathing down and opens the body through passive stretching. Every pose is supported - it is about listening to your body and adapting a position so that it is comfortable to be in for 4-5 minutes. During the long holds of restorative yoga, muscles begin to let go of tension and stretch and so the props, rather than the muscles, are used to support the body. This is followed by singing mantra. Tim plays harmonium, flute, shruti and will lead the singing. Mantras are in a sense a further warm up to the gong bath as they help block stress hormones and releases endorphins. Singing mantras enhance positive alpha, gamma, delta brainwaves—the brainwaves that are also induced during the gong bath and lead to deep relaxation. Chanting increases immune functions, and lower blood pressure. The sound of the mantra literally drowns out the negative voices in our heads. A guided meditation follows and this will be done lying down in preparation for the gong bath at 5pm. Benefits of these monthly extended gong bath: Enhances flexibility and helps to deeply relax the body. Through restorative yoga, mantra singing and a guided meditation the mind stills. This level of relaxation improves capacity for healing and helps balance the nervous system and the immune system. We develop qualities of compassion and understanding toward others and self. A wonderful way to enhance mood. This is an optimum state in which to enter a gong bath. It isn’t always possible to have this degree of preparation and hence the extended gong bath is offered once a month. £20/session including gong bath and refreshments. There will be a 5pm and 7pm session as usual. The 16th is the last Sunday gong bath before the New Year. There will be a Gong Bath on 27th December and then the baths will run twice a month from 6th January fortnightly ie next bath after this is 20th January. THIS WEEK THERE IS ONLY A 7pm SESSION AS THE NORMAL 5pm SESSION WILL START AT 3.15pm AS THIS IS AN EXTENDED GONG BATH. THE EXTENDED GONG BATHS ARE HELD ON THE LAST SUNDAY OF EVERY MONTH. THERE will be no 5pm GONG BATH as the extended gong bath will go straight through to this. Those wishing to come to 5pm gong bath please consider 7pm or book the following week. We will begin with a restorative yoga session. This deeply relaxing and beneficial session begins to slow breathing down and opens the body through passive stretching. Every pose is supported - it is about listening to your body and adapting a position so that it is comfortable to be in for 4-5 minutes. During the long holds of restorative yoga, muscles begin to let go of tension and stretch and so the props, rather than the muscles, are used to support the body. This is followed by singing mantra. Tim plays harmonium, flute, shruti and will lead the singing. Mantras are a wonderful introduction to the gong bath as they help block stress hormones and releases endorphins. Singing mantras enhance positive alpha, gamma, delta brainwaves—the brainwaves that are also induced during the gong bath and lead to deep relaxation. Chanting increases immune functions, and lower blood pressure. The sound of the mantra literally drowns out the negative voices in our heads. A guided meditation follows before lying down for the gong bath at 5pm. Benefits of these monthly extended gong bath: Enhances flexibility and helps to deeply relax the body. Through restorative yoga, mantra singing and a guided meditation the mind stills. This level of relaxation improves capacity for healing and helps balance the nervous system and the immune system. We develop qualities of compassion and understanding toward others and self. A wonderful way to enhances mood. OCTOBER DATES: 7th, 14th, 21st & 28th 5pm & 7pm. THERE IS AN EXTENDED GONG BATH on the last Sunday of each month. For those who wish to come there are details below. If you are coming to the regular gong baths, the Studio is open from 4.45pm. on these Sundays. We will begin with a guided meditation followed by a restorative yoga session. This practice is about slowing down and opening the body through passive stretching. During the long holds of restorative yoga, muscles are allowed to relax deeply and so the props, rather than the muscles, are used to support the body. Benefits: Enhances flexibility. Deeply relaxes the body. Stills the mind. Improves capacity for healing and balancing. Balances the nervous system. Balances the immune system. Develops qualities of compassion and understanding toward others and self. Enhances mood states. This is an optimum state in which to enter a gong bath. It isn’t always possible to have this degree of preparation and hence the extended gong bath is offered once a month. From the previous event, it was clear that a restorative rather than a Hatha yoga practice was preferred. £20/session including gong bath and refreshments. This Sunday we had the intention of friendship and used softer, gentler sounds before the start f the gong. Every gong bath is different both for those who are attending and for those playing because the gongs have their own unique characters and react to the vibrations in the room. Each week is different as the make up of people changes. Autumn is a time of harvesting and storing. We are getting ready for shorter days and this affects us on all levels. It is important to encourage the body to relax and heal in the run up to winter. The four nights from October 14th –up to 17th, is a time to watch for the waxing moon to move from Saturn to Mars as we can see Saturn and Mars because they are bright planets. On the night of October 14th, we can differentiate between Saturn and Mars, because the moon is much closer to Saturn on this night. Saturn is the farthest world that you can easily see with the eye alone. Although at the moment it’s more than 10 times the sun-Earth distance away from Earth. Saturn shines brilliantly and it is amazing to think that this huge planet has the volume of more than 750 Earth’s and its reflective rings are tilting nearly maximally toward Earth. Saturn brings structure and meaning to our world. Saturn knows the limits of time and matter and reminds us of our boundaries, our responsibilities and our commitments. It brings definition to our lives. This Sunday’s gong bath is a time ponder upon the need for self-control, of boundaries and of defining our limits. This is the day before the new moon so the night sky will be dark by the time you leave the gong bath. When the moon is most nearly between the Earth and sun for any particular month, astronomers say it is new. We don’t see a new moon in the sky, unless there’s a solar eclipse, with the moon directly in front of the sun. Usually the new moon passes near the sun rather than in front of the sub in our sky. Either way – in front of the sun or just near it – on the day of new moon, the moon travels across the sky with the sun during the day, hidden in the sun’s glare. In the language of astronomy – a day or two after each month’s new moon – a slim crescent moon always becomes visible in the west after sunset. Astronomers call this slim crescent a young moon. New moons are important in many cultures and also in permaculture - those who plant by the moon. It is seen as a time of new beginnings, of discarding the old and of starting new projects with renewed enthusiasm. Having a gong bath the day before a new moon can serve to focus our intentions. As Dr Joe Dispensa writes in Breaking the Habit of Being Yourself, it is important though to have the corresponding emotions that go with that intention. It is the elevated emotions you feel when thinking about the fruition of your intention that are imperative to its manifestation. He writes: “If you ask, you are in lack because you are wanting—and wanting means you don’t have it’’. If, however, you get up as if your intention has already happened, “you’re no longer in lack because you’re feeling the emotions of your future in the present moment”. A gong Bath is a special time to do this as it is a time of relaxation where we can access a deeper consciousness. 23rd September: The Harvest Moon is the name given to the full moon closest to the autumn equinox, which will fall on 23 September 2018 in the UK. The Harvest Moon will shine in the night sky on the 24th September in 2018 (earlier than last year). The name relates to the way the moon's light helped famers. This is particularly relevant around the time of the full Harvest moon, when there's little darkness between sunset and moonrise. 16th September: The gong bath on Sunday marks the first quarter moon and this is often called a half moon because we can see exactly 50% of the moon's surface illuminated. The Moon does not radiate its own light, but its surface reflects the Sun’s rays. Half of the moon’s surface is always illuminated by direct sunlight, except during lunar eclipses when Earth casts its shadow on the Moon. . Details of 9th September: Because the Earth, the sun, and the moon are all perfectly in line, the tides are at their highest and their lowest during both the full and new moon. Both of these moons are the most defining phases of the lunar cycle and water (the element that governs our emotions) is transformed by its energy. The full moon is all about completion and the new moon is just the beginning, always with our eternal spirit in mind. We can see it a the new moon is a birth. As the waxing phase journeys on, the moon grows and matures until its reaches its ripest point: the full moon. The waning phase recedes the moon, turning it into a thin crescent, then dissolving it completely; the birth has become a death. Making goals, setting intention, sowing the seeds of future plans; a new moon gong bath is perfect time to set intention as it is symbolic of the second chance we are given over and over again. This will be held once a month (last Sunday of every month) and will be before the 5pm session only. It will start at 3.15pm- 4.45pm and will include a meditation that will focus on a theme, followed by a gentle yoga session to stretch and relax the body to help release physical stress. There will be a short break for tea before the gong bath at 5pm. There is the option to stay on the mat and continue to relax/meditate to music, maintaining the sense of peace. This is an effective way to prepare for a more profound gong bath experience. Deep relaxation is a conduit to healing on all levels - be it a good nights sleep or a feeling of gentle bliss throughout the body. £25 for whole session i.e. 3.00pm - 6.15pm. Talking about how the human body begins to resonate in synchronisation with other vibrations: ‘The result may be stimulation or relaxation of the system and it happens through a process of ‘auditory driving’. This basically means that the sounds we hear and feel can move mind and body, alter consciousness and allow an individual to drift into a state of being similar to a trance or deep relaxation. This in turn creates a ‘space’ in which a therapeutic process can begin. During the summer months the Gong Baths will no longer be weekly. In July there are just two gong baths 5pm and 7pm on each date. Weekly gong baths will resume again in September. Every gong bath is different because different instruments used and the gongs themselves react differently according to the energy in the room. We are changing constantly and so how we feel and react changes from hour to hour. There will be some over toning at the beginning as well as various percussion sounds: flutes, shruti, rattles, Burma bells, ocean drums, kalimba, Tibetan bowls and many other native instruments. There will be an all night gong puja on evening of 20th June into morning of 21st June. Details under workshops. As a result there will NOT BE A GONG BATH ON 24TH JUNE. There is more information on the benefits of gong baths in previous listings. The main contribution that a gong bath makes is that a gong bath can help reduce stress as well as opening up emotional blockages. Scientific evidence suggests that sound therapy causes human DNA strands to auto-repair when they get damaged. Not only does playing certain tones promote vitality and healing, it may also enhance happiness. There are two sessions each Sunday: 5pm and 7pm. Refreshments afterwards. The Gong Baths are weekly and you will find that every gong bath is different because not only are different instruments used but the gongs themselves react differently according to the energy in the room. We are changing constantly and so how we feel and react changes from hour to hour. There will be some over toning at the beginning as well as various percussion sounds: flutes, shruti, rattles, Burma bells, ocean drums, kalimba, Tibetan bowls and many other native instruments. 29th April: The Sun is in Taurus; Mercury is in Aries; Venus is in Gemini; Mars is in Capricorn. The Sun in Taurus is methodical, sensual, and receptive. The Sun in Taurus is most active when it is defending or resisting things! Mercury in Aries, we are less concerned with objective viewpoints and explanations, and more concerned with reaching a decision…quickly! Venus in Gemini we have a finger in every pie. Mars in Capricorn is deliberate, persistent energy. We consider the future and the consequences before taking action during this cycle. 8th April: The Moon will be in a Third Quarter phase. Sometimes called a Last Quarter Moon, this phase occurs roughly 3 weeks after the New Moon when the earth is three quarter of the way through it’s orbit around the earth. 15th April: The Moon will be in a Waning Crescent phase. In this phase the Moon’s illumination is growing smaller each day until the New Moon and is getting closer to the Sun as viewed from Earth and the night side of the Moon is facing the Earth with only a small edge of the Moon being illuminated. 22nd April: The Moon will be in a First Quarter phase. This phase occurs roughly 7 days after the New Moon when the earth is one quarter of the way through its orbit around the earth. Exactly half the moon will be illuminated and half dark. There is more information on gong baths on the previous dates and on the Sound Therapy page. Please book by email: sarahemarten@gmail.com £10/session. Spring has sprung and the Easter weekend is a time to be at home and relax. It is a period of rejuvenation, new energy and intention. The full moon is on 31st March - it is a Blue Moon as there are two full moons in March and the final Blue Moon of the year. We also had one in January but two Blue Moons in one year is rare and it won’t happen again until 2037. So come an bathe in the vibrational sound of gongs and other instruments and restore, relax and rejuvenate as we celebrate the first days of Spring. You don't need to bring anything except a cushion for your head. Afterwards there will be refreshments including chocolate. It is believed that gong baths help to reduce stress as well as opening up emotional blockages. Scientific evidence suggests that sound therapy causes human DNA strands to auto-repair when they get damaged. Not only does playing certain tones promote vitality and healing, it may also enhance happiness. Apart from gongs, there’s a variety of other instruments used during the bath. They include Tibetan singing bowls, Burmese bells, ocean drums and kalimbas. It is a very mediative and relaxing experience and because the body is in this state it has the opportunity to return to homeostasis -the ability of the body or a cell to seek and maintain a condition of equilibrium or stability within its internal environment when dealing with external changes. The vibrations of the gongs, their overtones and undertones can help maintain and regulate the body's function. The gong baths are weekly and each week will be different as indeed is every gong bath but we will be using more or less of certain percussion instruments before and after the bath - shruty, native rattles, flute, ocean drums, Burmese bells, Tibetan bowls, Kalimba, Koshi wind chimes, handpan and others. We had no full moon in February which is rare and as a result there are two in March. The first on March 2nd and the second on March 31st. As we saw in January, this is not a common event and is referred to as a Blue Moon. The modern day definition of a Blue Moon is when there are 2 full moons in one month. A full moon occurs roughly every 29.5 days and on the rare occasions when the full moon falls at the beginning of a month there is a good chance a Blue Moon will occur at the end of the month. The next blue moons in January and March will be in 2037. 4th March - the Moon will be in a Waning Gibbous Phase. This is the first phase after the Full Moon occurs which was 2 days ago. It is a good time to reset your intentions and link back with nature. 11th March - Mothering Sunday. The Moon will be in a Waning Crescent phase. In this phase the Moon’s illumination is growing smaller each day until the New Moon. 2 days after the last quarter. 18th March - the Moon will be in a Waxing Crescent Phase. A Waxing Crescent is the first Phase after the new moon which was yesterday and is a great time to see the features of the moon's surface. 25th March - the Moon will be in a Waxing Gibbous phase. The first quarter was yesterday and this phase is when the moon is not yet a full moon (in this case a Blue Moon) which will occur on 31st so there is that build up of expectancy and it is a good time to reflect. The gong baths are now weekly. February doesn't have a full moon this year as we had two full moons in January. This month the Moon is new and lined up with the Sun on the 15th. The early months of the year favour views of the evening waxing crescent Moon which appear just after the new phase. This is because the Moon’s path in the sky tilts steeply against the western horizon after sunset during the spring. The challenge of seeing a very thin lunar crescent can become addictive but it’s important to wait for the Sun to have set properly before looking. Failure to do so could lead to eye damage. In order to spot a thin Moon, you need to know where to look and to make sure that the horizon in that direction is unobstructed. The weather also needs to be kind. £10 per session. Please book. Refreshments afterwards. Nearly new moon- the new moon is a few hours into 15th. This waning crescent is 6% visible on Sunday evening. A tiny fingernail in the sky. The new moon is the perfect time to create what you want to manifest in your life. Lunar cycles are very significant in energetic terms. New Moon energy is the time to sow new projects & intentions. We will start with some relaxation beforehand and some breathing to fully relax. Next Gong Bath is 28th January. 5pm and 7pm sessions. This Sunday is a super moon. When a full moon coincides with its closest approach to Earth, it is called a Super Full Moon. Because it's so close to Earth, a Super Full Moon looks about 7% bigger than an average Full Moon. It is biggest during winter. Supermoons during Northern Hemisphere winter months tend to look larger than Supermoons that occur during the rest of the year. At this time of the year, Earth is closer to the Sun. Because of this, the Sun's gravity pulls the Moon closer to Earth, making any winter Super Full Moons look bigger than summer Super Full Moons. The best time to enjoy a Super Full Moon is after moonrise when the Moon is just above the horizon, weather permitting. At this position, a Super Full Moon will look bigger and brighter than when it's higher up in the sky because you can compare the apparent size of the Moon with elements in the landscape like hills, foliage, and buildings. The greatest difference between high and low tide is around Full Moon and New Moon. During these Moon phases, the gravitational forces of the Moon and the Sun combine to pull the ocean’s water in the same direction. These tides are known as spring tides or king tides. This is a wonderful time to have a gong bath as our bodies are very receptive to the vibrations and energy of the gongs and can have a very positve effect espeially during this time when the stress of Christmas can begin to play into our lives. Please book: sarahemarten@gmail.com £10 Mats, balnkets, bolsters and eye masks provided. There are refreshements afterwards. Join us for an all-night Gong Puja. This is another opportunity to bath all night in the resonant fullness of the gongs. The Gong Puja is a Ceremony, Celebration and Sound Meditation, originated by Grand Gongmaster, Don Conreaux. The Gong Puja experience lasts about 7 ½ hours which is the equivalent of 10 x 45 minute Gong Baths. The normal length for a sound journey being 45 minutes. Immersed in the sound of the gong and in the subtle ether’s of the sound bath the Innate Intelligence inherent in us all can more easily restore, rejuvenate, regenerate, cleanse, and re-establish holistic resonance between the mind/emotion/body. All gong masters around the world are working towards peace, the creation of a compassionate world without violence or abuse for all the children of today and tomorrow, and a healthy planet. This puja will be dedicated towards this aim and you are also invited to create a personal intention for yourself and your loved ones. 9.30-9.45pm – Arrival and settle in. 6.15am – there will then be a time to wake in your own way, either staying in the gong space or sitting round an open fire before breakfast at around 7am. Breakfast is provided. On booking, please let us know of any dietary requirements. Wear practical loose fitting clothing. Yoga mats and blankets are provided but please bring with you anything you wish to make yourself comfortable. E.g. extra mattress/roll mat, pillow, sleeping bag, duvet, blanket. £50 incluidng full cooked breakfast on Sunday morning and refreshments available before and through the night if needed. Today the Sun moves into the sign of Scorpio. The sun shines light on all life and illuminates your personality and ego identity. Scorpio is the sign of depth and intensity. Now we start the season of Scorpio. The sun shines light on the darker side of life. The planet of the masculine within us all, Mars enters the sign of relationship, harmony and balance, Libra. The moon is in a waxing crescent phase -the first phase after the new moon. The beginning of a cycle represents a clearing or release. The new moon is considered a growth phase and is an ideal time to plant seeds in our gardens as well as our hearts for the future. This is an invitation to start afresh, call in intentions, and set the tone for the next cycle. Mats, blankets and eye masks provided and refreshments afterwards. £10/session. Please bring a cushion for your head. The gong bath's vibrational sound and frequency can help reduce stress, alter consciousness, creating a deep sense of peace and well-being for better health. The mind begins to empty and as J Krishnamurti once observed: "To be empty, completely empty is not a fearsome thing: it is absolutely essential for the mind to be unoccupied; to be empty, unenforced, for only then can it move into the unknown". The gong bath's vibrational sound and frequency can help reduce stress, alter consciousness, creating a deep sense of peace and well-being for better health. To greater amplify the healing effectiveness of this Gong Bath all you need to add is intention and the energy of a large moon. Autumn is the season of the metal element and the time of the year for gathering and consolidating energy. Nature is slowing down after a productive summer in preparation for winter’s long sleep and our bodies have the tendency to do the same. Just as the leaves begin to turn colour as nature’s energy slows, our bodies begin to wind down in preparation for the long months ahead. Everything around us is vibrating at a frequency, whether we hear it or not. Sound frequencies can affect us on a cellular level, influence how we feel and function. Sound healing practices like a Gong Bath uses vibrational sound and frequency to help reduce stress, alter consciousness and create a deep sense of peace and well being for better health. As summer ends, this is time to experience feeling nurtured in a state of deep relaxation. This is when healing take place as you are bathed by gentle sound waves, after which you will feel like you have had hours of sleep. To greater amplify the healing effectiveness of a Gong Bath you can add an intention before a session. Once you start to opening yourself up to this way of thinking and visualise a positive outcome for anything in your life the success of the outcome is intensified because the energy of intention is a powerful tool. Mats, blankets and eye masks are provided. Please book. £10/session. Refreshments.